“It is that time of year again to start thinking about water conservation and saving rain water” says Shawn Farrell, Board of Selectmen, Hamilton MA . “Rain fall is hard to gauge. Harvesting rain water with a rain barrel can mitigate the irregular patterns of rainfall. To help homeowners and the town manage their water supplies, Hamilton and Wenham are offering residents the opportunity to purchase rain barrels at a discount”. Throughout New England, residents depend on infrastructure made in the years following WWII, to supply water to far fewer homes. These infrastructures are now heavily taxed. Leaky pipes and water main breaks are only part of the problem. Storm water runoff creates additional havoc. Capturing and storing water at the home and the use of rain gardens are the two most effective ways to minimize stormwater runoff. Each year homeowners face higher prices for water and sewer. The wholesale rate of water from the MWRA has increased 49% over the 10-year period from 2008-2018. Saving rain water helps homeowners hedge against the rising cost of water. Rain water is a free healthy alternative; it is organic, has no chlorine, no fluoride and no chemicals. It is an excellent water source for plants, gardens, lawns and any non-potable use. Regular use of a rain barrel can pay for itself in one season. One tenth of an inch of rain on a 1000 square foot roof –about 25 minutes of moderate rainfall– will fill a 60-gallon Rain Barrel. New England typically receives 17” of rain during the growing season from May through September. This provides enough water to fill 170 Rain Barrels. At 2 cents a gallon homeowners can expect to $204 worth of water. Droughts stress residential landscaping and town water facilities. In 2016, 168 communities in Massachusetts faced restrictions on nonessential outdoor water use – 47% of the Cities and Towns in the state. There is no restriction on rainwater use. 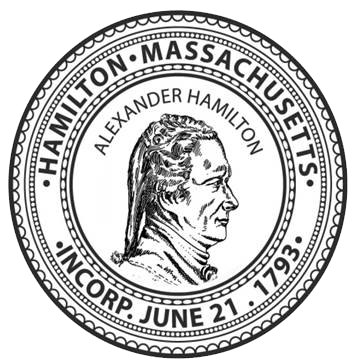 Hamilton chose to work with the Great American Rain Barrel Co., a local food importing company that has been repurposing shipping drums into Rain Barrels since 1988. Last year 30% of Massachusetts Cities and Towns partnered with The Great American Rain Barrel Co, selling over 3000 barrels. Great American Rain Barrel Co has been approved vendors by the MASSDEP for the state since 2010. Barrels are being offer to residents for $69 and will be available for pick up on date on Saturday May 18th from 8:00am-12:00 pm at Hamilton DPW 577 Bay Road, South Hamilton MA 01982. Deadline for purchase is: May 12th Midnight. To participate in the Rain Barrel Program and find out more about the barrels, please visit: www.tgarb.com/community/ and select your town.